Vancouver, British Columbia--(Newsfile Corp. - October 16, 2018) - Contact Gold Corp. (TSXV: C) (the "Company" or "Contact Gold") is pleased to report the development of Elliott Dome; a new, high priority Carlin Type gold target located on the northern part of the Pony Creek gold property ("Pony Creek") immediately adjacent to the Jasperoid Wash discovery of Gold Standard Ventures. 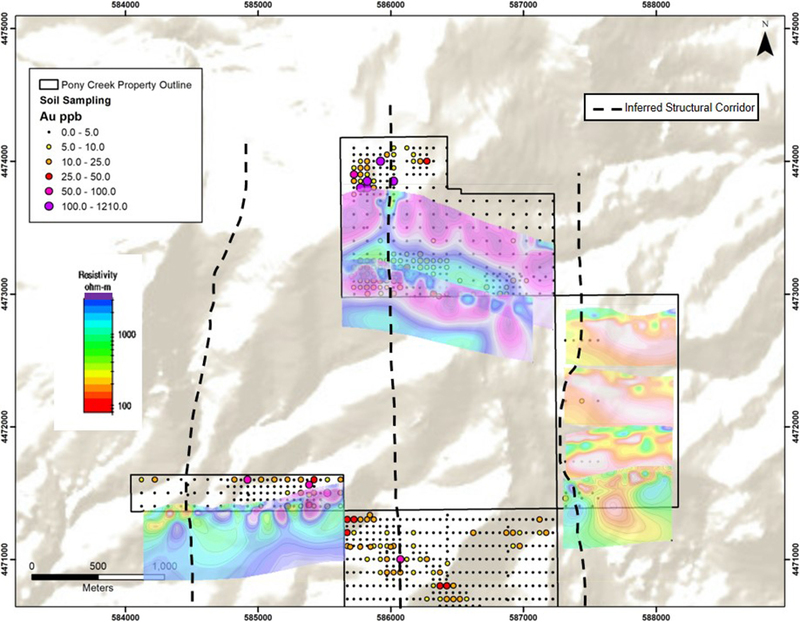 Elliott Dome was identified through surface mapping, rock and soil sampling and geophysical anomalies apparent in seven lines of CSAMT data that the Company obtained from a neighbouring company. 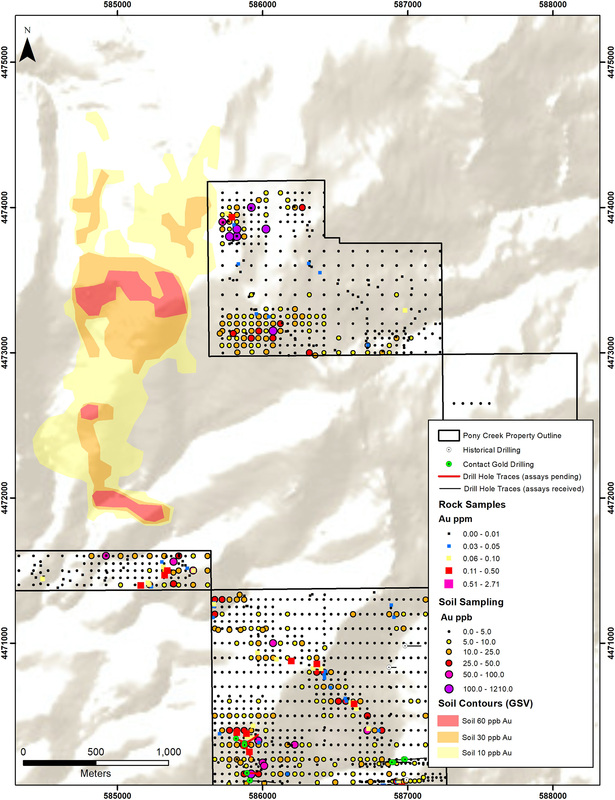 This newly acquired geophysical data further supports this new high priority target located on Contact Gold's ground. The Elliott Dome target is one of five new, large, high-priority drill targets at Pony Creek. Other targets include Pony Spur, Moleen, North Zone, and the West Target that will be further tested in 2019. The Company made new gold discoveries at the never-before-drilled Pony Spur and West targets in 2018, and to date has reported 35 of 51 drill holes completed at Pony Creek this year. "Target generation efforts at Pony Creek continue to produce new large-scale drill targets as an integral part of our successful 2018 drill program. 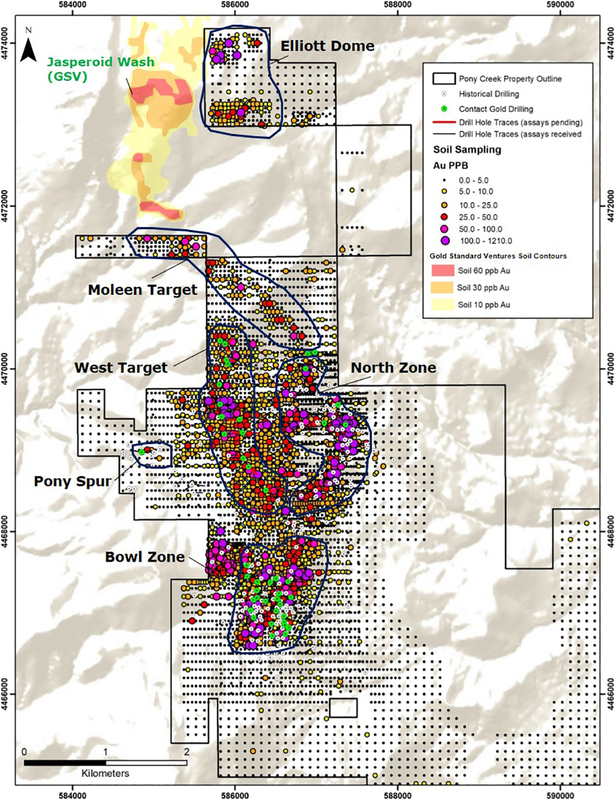 The methods validated by the recent oxide gold discovery at the West Target also produced this new Elliott Dome target which is defined by the same exciting characteristics; strong gold values in rock and soil sampling, widespread hydrothermal alteration typically associated with Carlin-style gold mineralization and sits within the same structural corridor that hosts Pony Creek's Bowl Zone, the West Target gold discovery and the Dark Star and Emigrant deposits." stated Matt Lennox-King, CEO of Contact Gold. The Company has completed 51 holes in 2018, totaling over 10,863m of drilling. Results are pending for 16 holes.